On Thursday, April 11, the We Are Family Foundation will honor Sting and Trudie Styler with the Humanitarian Award at the Manhattan Center's Grand Ballroom in New York City. 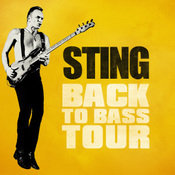 The event will feature performances by Sting, Nile Rodgers & CHIC and special guests. The We Are Family Foundation, a not-for-profit organization founded by songwriter/producer Nile Rodgers, creates and supports programs to inspire and educate the global community about respect, understanding, and cultural diversity. The Humanitarian Award honors those who have made tremendous efforts and inroads to help improve the human condition throughout the world. Previous recipients include Jackson Browne, Peter Gabriel, Sir Elton John, and television and radio host Larry King. Tickets are available for purchase now at www.wearefamilyfoundation.org, with all proceeds benefitting the We Are Family Foundation. Hope to see you there! When l hit the submit button ,nothing came up in the section,l thought,bummer,something wrong so l typed again,again el zippo came up,hence the 2 comments plus the one on the message boards,so apologies,there must be some kind of time lock on when they appear,are the comments checked before printed ? Totally thrilled for Sting & Trudie,they have helped,enhanced & enriched so many peoples lives through their selfless humanitarian work for decades,a total deserving honour,have a great night,Willie. I am totally delighted for Sting & Trudie,they say that ones stature is measured by what they do with what they have and Sting & Trudie have helped,enhanced and enriched so many many peoples lives for decades and are truly so deserving of this honour,my heartiest,heartiest congratulations to you both,have a great night,Willie.